Strengthen Your Bones and Joints Naturally! 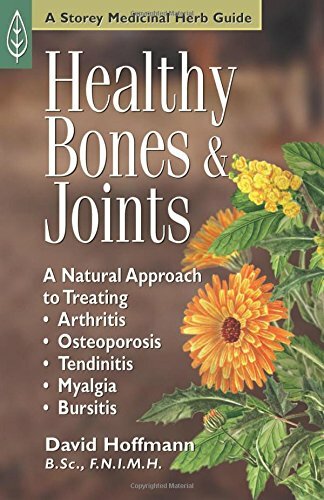 - Clear explanations of how herbs such as meadowsweet, mustard, and bay tree can be used in daily regimens to help prevent bone and joint diseases. - A thorough overview of common musculoskeletal conditions, from arthritis to osteoporosis - with discussion of a wide variety of preventive strategies and healing herbal formulas for each ailment. - An A-to-Z directory of the herbs that are most helpful for the musculoskeletal system - along with preparation instructions and dosage guidelines. Discover how nature's own medicine chest can help you enjoy a healthier life, increased vitality, and stronger bones and joints! David Hoffmann has been a clinical phytotherapist for almost 20 years. He is a founding member and past president of the American Herbalists Guild. He is on the advisory board of the American Botanical Council, the peer-review boards of Herbalgram and the Protocol Journal of Botanical Medicine, and the steering committee of the American Herbal Pharmacopoea. He is the author of 17 books, including Healthy Bones & Joints, and teaches phytotherapy throughout the world. He is visiting faculty at Bastyr University, The California Institute of Integral Studies, the National College of Phytotherapy, and the Rocky Mountain School of Botanical Studies. He lives in California.